As a result of the Oslo Accords, Hebron was in 1997 divided into H1 and H2 by the Hebron Protocol of 15 January 1997. After 30 years of occupation, IDF withdrew from 80% of the municipal territory, which is now H1, under the Palestinian Police Foreces (PPF) – similar to area A in other parts of the West Bank. H2 is under the control of IDF. 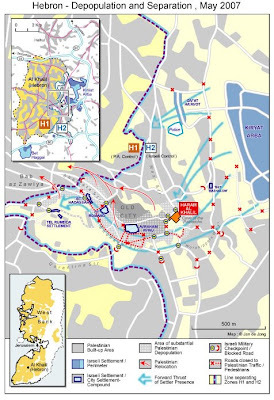 As you can see on your maps, all Hebron settlements are in H2 area, and Palestinians living in H2 have been subjected to severe restrictions of movement and “silent segregation” treatment by the IDF since then – also victims of countless violent attacks by their settler neighbours. In reaction to increased colonisation, Palestinian resistance groups waged various attacks on Israeli settlers during the 1980ies. During the first Intifada (1987-1993) the Hebronites experienced endless curfews. The first Intifada ended with the signing of the Oslo accords and the creation of the Palestinian National Authority in 1994.